Realize charging your phone immediately just by putting down your phone onto the wireless charger, no need to plug any cable to your phone! This Qi standard wireless car charger can charge your phone quickly, reliably and safely, suitable for all Qi-enabled devices. 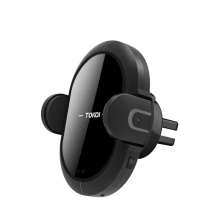 It not only is a wireless charger but also is a car air vent phone holder, perfect for using in your car. This wireless charger will bring you limitless charging experience and safe driving experience. Qi standard wireless car charger, suitable for all Qi-enabled devices. There is no need to plug any cable to your phone and realize wireless charging. Up to 10W charging power, which can charge your phone very quickly. Built-in intelligent infrared sensor makes it easier for you to pick up or put into your phone. 2-in-1 car wireless charger and air vent holder design, which can be fixed tightly on the car air vent blade, easy to install and use. Supports 360° rotation, easy to be adjusted to realize the best viewing angle of your phone while driving. One-hand operation, you can put your phone in or take it out just with one hand, no need to move your eyes from road during driving, ensuring safe driving. The soft rubber pad of the holder clip can strengthen buffer, protecting you phone from damaging and scratching. 1. Only the Qi standard phones can use the wireless charger to charge, please make sure your phone support Qi wireless charging technology if you use the charger. 2. To make the fast charge function available, please make sure that the phone itself support fast charge, and you need to connect the power adapter(not included) that support fast charge.